How can voltage burn out an LED? I understand how a current higher than what the LED is rated for can burn out an LED, but how does something equivalent happen with voltage? If the correct current is on an LED but the voltage is too high, what causes it to burn out? I just don't see what effect voltage has on the LED. Voltage and current are intimately related. If you attempt to increase the voltage across an LED, the current will increase. Likewise, to increase the current through an LED, you must increase the voltage across it. 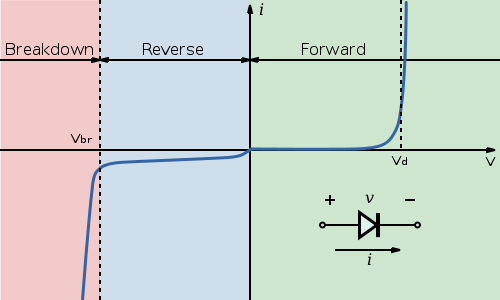 It is not possilbe to have the correct current through an LED, but too high a voltage across it. The image is taken from Using larger resistor values. First a diode(LEDs are diods) above a certain voltage is like a closed circuit. The problem is that like every wire, the diode has a critical point after which it will "burn", basically some irreversible transformations occur. So you can say the diode can sustain a certain power. Now, power is related to voltage like this: P = I*V where I is the current, and V the voltage. Since it's a closed circuit, the current is ∞ over it. The source can't give ∞ current, and is limited to a maximum amount. So over a diode, it will use that maximum amount and thus, I becomes a constant. Since I is constant, this means power increases proportional with the variable left, which in our case is V(voltage). If the current is "correct", then the voltage will be equal to the characteristic voltage of the diode. In the above schematic, Vdiode will be about 1.9V, because 10kV/1MΩ is about 10mA, and that's the voltage this particular LED arrives at if biased on by 10mA (datasheet PDF). Were you to change the value of R1 to 1 ohm, then approximately 10kA would briefly flow through the LED, resulting it a burned-out LED. A key concept to grok is the difference between Constant Current and Constant Voltage regulators. A typical "bench" power supply is Constant Voltage, meaning it puts out X volts at some current, and will regulate its output to remain at X volts whatever its load. Diodes approximate Constant Current regulators to a degree, because you can think of the voltage being dependent upon the current. I understand why you are having a tough time here. An LED is not like a resistor/heat lamp per se. An LED is like any other diode, except in the forward conducting mode as the electrons flow through the junction they cause the atoms to shake at a specific frequency, and not just randomly like a normal conductor. This shaking causes light. Think of them as a whistle. One note, one amplitude. (Much like a blade of grass held between your thumbs.) --- and that takes energy. If you force too much air, because of a higher pressure (voltage), you will blow out the reed that is making the vibrations. The above response is correct in that voltage and current are intimately related. If you think of a regular resistor that follows Ohm's law, then you can see the relationship V = I*R. With a diode, this relationship still exists, but it is not linear, which is why in data sheets of LED's you will see plots of the Voltage and Current. So if you increase the voltage across the LED above a certain threshold, the current will also increase, burning out the LED. The reason why a power-line has high voltage and low current is that power-lines are super long, which increases its resistance. Big Voltage = Big Resistance * smallerCurrent. It still indicates that voltage and current are immediately related. Diodes inhibit Avalanche in Reverse Bias. LED are not exception they being diodes. LEDs have a tolerance of a specific amount of reverse voltage that it can withstand but once this is exceeded, the LED can be damaged. So any excessive reverse voltage (VR) applied can cause avalanche breakdown. The easiest you can do is adding a simple PN-junction diode in series with the LED (if you wish to save your LED from getting damaged). Not the answer you're looking for? Browse other questions tagged led voltage current basic or ask your own question. Why do we need to find the current? 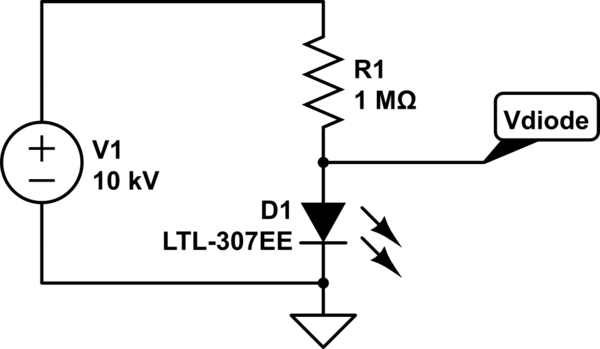 Does a led determine itself current load? Blue light LED works without any resistor and doesn't burn out. Why? Will my chain of LED strips burn out? can leds take varying voltage > listed voltage, with constant current? Why do different resistors of the same power rating burn out / not burn out?